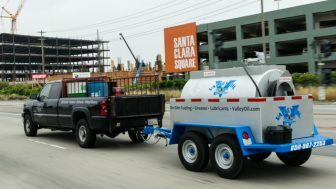 Valley Oil Valley Oil Company offers mobile fuel and oil tanks for rent or sale. Valley Oil Company offers mobile fuel and oil tanks for rent or sale. 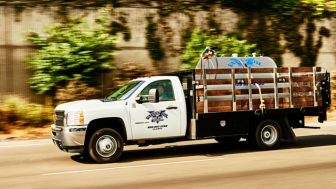 Tanks range from 100 to 3,000 gallons and can be special ordered to meet all your environmental needs. We offer single wall tanks with a containment bin, or UL rated double wall tanks. 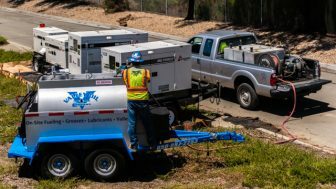 Our fuel tanks can be outfitted with 12 volt pumps, unlimited amount of fueling hose, a digital meter, and an automatic shut off nozzle and are ready for fueling the day they are delivered. Our oil tanks can be outfitted with air pumps, reels, 50 feet of 3/8 hose, and dispensing guns. Ask us about our mobile 500 gallon fuel tank trailers. They come equipped with an emergency spill kit and are ready for delivery today!